The Bureau of Alcohol, Tobacco, Firearms and Explosives (ATF) has released its 2011 interim Annual Firearms Manufacturers and Export Report (AFMER). The report shows U.S. firearms production in 2011 totaled 6,398,854 units, a 17.2% increase over 2010. 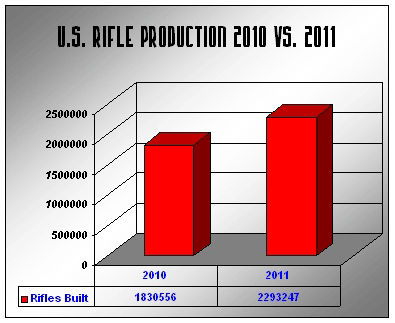 Rifle production showed a big gain, with 2,293,247 rifles produced in 2011 vs. 1,830,556 in 2010, a 25.3% increase. We think the large increase in rifle production is a good sign for the shooting sports, as the buyers of many of these long guns may join the ranks of competitive shooters. Compared to the previous year, in 2011 large increases were seen in the production of 9mm pistols (up 33.3%) and large-caliber (.40 to .50 Cal) pistols (up 32.9%). On the other hand, production of most classes of centerfire revolvers declined. Overall production of centerfire revolvers (.23 to .50 caliber) dropped 1.9%, with the biggest decline in the small (.32 cal and under) revolvers. Production of these smaller wheelguns dropped 39.8%, probably due to the stagnation of the Cowboy Action market. But production of big-bore (.45 to .50 cal) revolvers did rise 29.2%. Americans like big wheelguns, and the manufacturers ramped up 2011 production to fill the demand. This chart prepared by the NSSF. Click here for PDF version. 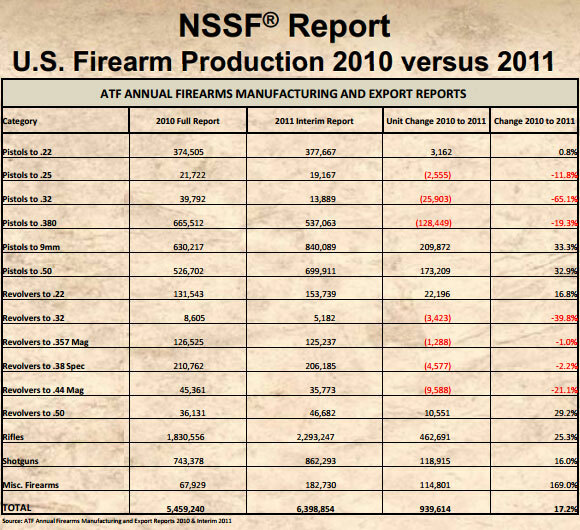 Share the post "U.S. Firearms Production Rises 17.2% From 2010 to 2011"
And the “Misc. Firearms” that increased 169%? That’s basically suppressors.